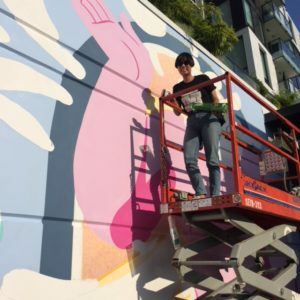 I have had an amazing time over the past few weeks during the Vancouver Mural Festival (VMF). I’m a bit surprised about that. Early in my art career, I created an elaborate mural with Dana Irving, Famous Painters. It was a beautiful Persian dining room designed for a private residence (think Persian rug but on mansion-scale and complete with realistic birds, flowers and decorative elements). It was great experience yet not one I thought I’d repeat any time soon. I was responsible for much of the detailed work along the ground which was physically demanding. 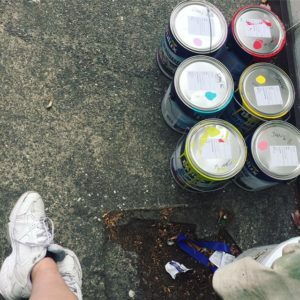 My preference became designing murals—rather than painting them. Following, I created a mural for a Vancouver children’s clothing boutique, several murals for the Saudi Arabian science and technology centre, SciTech, and a multi-story graphic design banner for a global conference. I can’t complain—I’ve had some stellar opportunities! Yet, I’d talked myself into doing just one type of mural—the one where I designed it and someone else produced it. To complicate things, my doctor recently said it may not be a good idea for me to make murals. Well, I disagreed. On the contrary, making murals made me feel great! 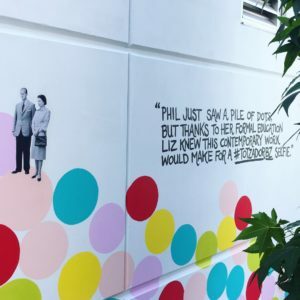 My word-of-the-year “VOICE” led me to writing about my art and interviewing some fascinating people such as muralist Richard Tetrault who was honored by the Queen for his community contributions, and David Vertesi, executive producer, VMF. They both helped found some of BC’s largest arts festivals. VMF was expected to attract over 125,000 people this year! 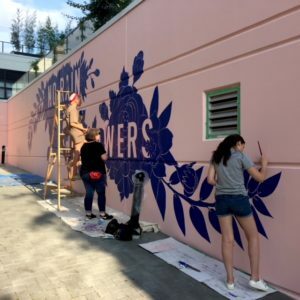 Their commitment and enthusiasm for artistic voice was so compelling that my reconnecting with mural-making seemed inevitable! VMF is a platform for artists to create what they want to share with the world. Murals are art people may see everyday. 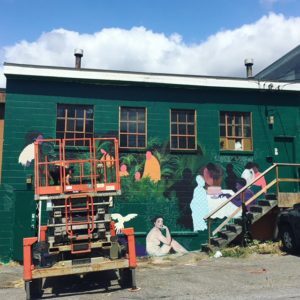 For many people, murals become as treasured as a city building or park. 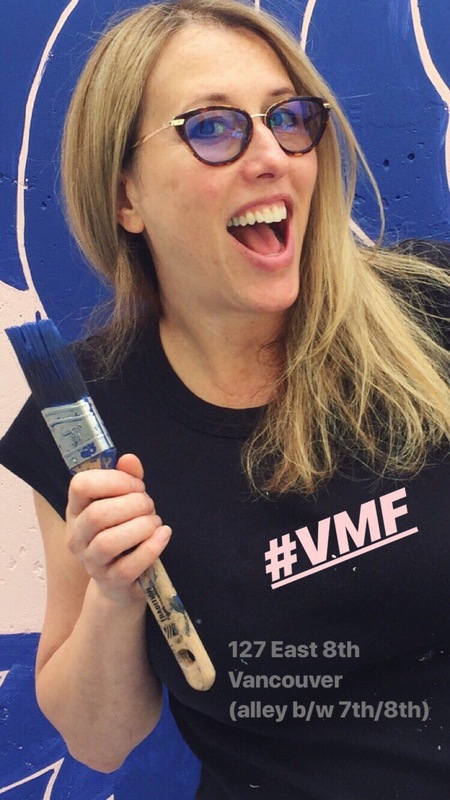 VMF murals reveal who our artists are and what they value. Flash forward and OMG! 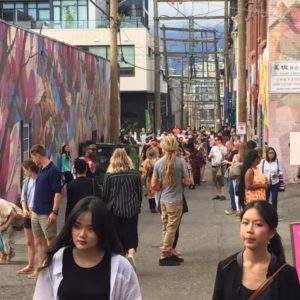 I love the Vancouver Mural Festival! 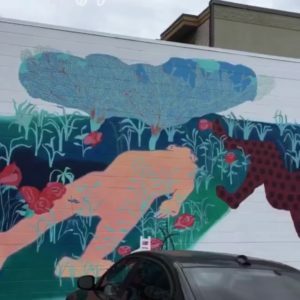 I had the opportunity to paint for a couple days on huge mural between 7th and 8th Avenue near Main Street in Vancouver, Canada. I met some cool people including artists, mural managers, curators, volunteers and art aficionados. Meet some of the people in this great Georgia Straight article. 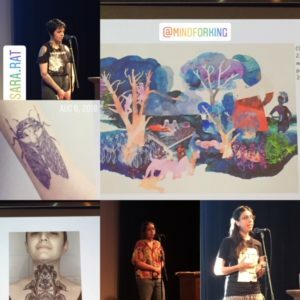 Last Monday night, the inspiring THRIVE Talks was full of great stories from local, emerging to international, established muralists. 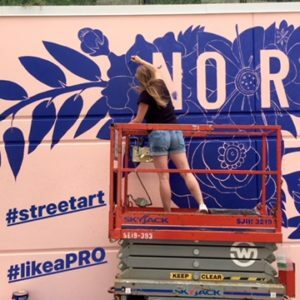 I loved collaborating with my fellow THRIVE women artists and learned a ton more about street art. Speaking with interesting people as they passed by was engaging and rewarding. I often paint in isolation and enjoyed the interaction. 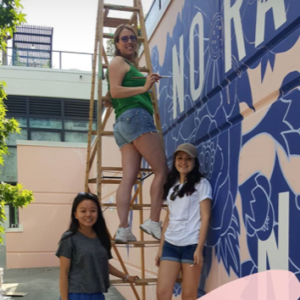 Tara Galuska’s No Rain No Flowers mural was coincidentally both a fitting concept for my personal story and a smart design for the team of fifteen women who worked tirelessly (2-3 painters per day) on the mural over about nine days. Thank you THRIVE Art Studio and VMF for making this experience possible. 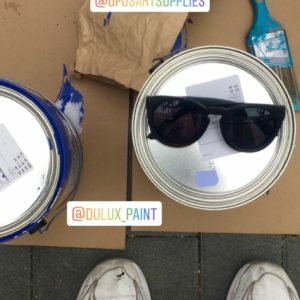 I was so grateful for the chance to bring my creativity to the street where everyone can enjoy it. I can’t wait to see where my next mural opportunity will come from! 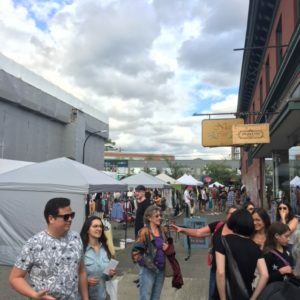 The festival is over but you can see the murals anytime on a your own tour (get your VMF map here) or with a Vancouver Mural Festival tour. Do you have a favorite mural? Let’s talk about it on my Facebook Page! Let’s do this! Hanna Benihoud, Crissy Arseneau and Paula Barrantes.